The Regal Social Club stood on the corner of Pound Lane and Nicholas Lane, with Dickens Drive just running down the side. 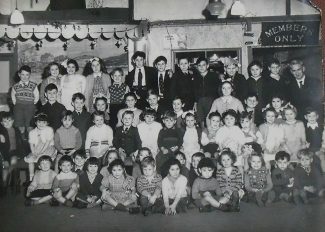 This photo was taken early 50s, I am partly hidden behind the girl with her finger tips touching the floor, my twin brother is further along to the right holding a torch, we were born at the end of 1947, we could only have been 3 or 4 at the time of the photo. Our dad used to take us there sometimes on a sunday lunchtime for a drink, and I remember a couple of children’s Christmas parties there. Jacquie, Alfie Sergent rings no bell with me I’m afraid. There is no reason that Alec Nuth would remember me. He was a year or two older than I and that made a great deal of difference at that age. He was good friends with my cousin and I believe they were in the same year at Chelmsford Tech. Alec may remember Tony better as Tony Hall-Davies. That was his name at the time. Upon joining Barclays he was told that he could be Tony Hall or Tony Davies. It seems that while a double barreled name might be fine for a bank manager, it was too ostentatious for a mere junior clerk. Ever since my cousin has been Tony Davies. Alan, just spoken to Alec and he said he did play football. As I said, the only one I knew of that played was my dad. Alec is my dad’s nephew but he was only 8 years older than Alec. I only know what my dad told me about his football. I have been asked to say if the missing player could be Alfie Sergent? (Alec said he remembers him as a player). I have to go to Alec’s and “get up in the loft” ha ha! to look for more pictures (can’t wait). He doesn’t recall you or Tony but I’m sure once his memory is jogged, he will, his memories are great! whereas mine’s not and I’m 54! I love all this information, fascinating! Jacquie — Across the top of the Home page click “People”. Then on the third row down click “Sports and Sports”. Then on the first row click “Football Teams”. Then on the third row down click “Laindon Football Team”. There you will find a picture of the young Alec Nuth. Or at least the one of seemingly quite a few Alec Nuth’s that I knew. Sorry! Alan Davis. Alan sorry I hadn’t seen your comment after mine, (not familiar with the site yet) lots of confusion regarding the Alecs of the family. I Alec my cousin, indeed was associated with Chelmsford Tech, I have no information for you Alan, other than I will be seeing Alec in the next 2 weeks and he will follow this up with you. I can say that Alec’s Dad Bill, and Bill’s brother (also Alec) and indeed Alec were all very tall! ha ha, the only footballer I am aware of out of the family was my Dad Patsy Nuth. Once again apologies for missing your comment Alan. I look forward to getting more information for you. Regards. Jacqueline. Jacquie, Is your cousin Alec the same Alec Nuth who went to Chelmsford Tech around 1946- 1950? If so he is a year or so older than I and was a good friend of my cousin Tony Davies who also attended the Tech. Tony is now living in Chelmsford following a career spent with Barclays. I remember Alec quite well as a tall, well built chap, who was active on the local sports scene — particularly football. Hope I can help with a few points. I will check with my cousin Alec Nuth (son of Bill and Mabel ). Bill run the Regal Club, I shall check with Alec as to dates etc. My uncle Bill had a bar in Spain afterwards and my Dad was Pat Nuth (Pam mentioned her Dad worked for him). Pam I would love to hear more from you about this please if Admin could pass on to both ladies. Right, the confusion as to Alec senior and Alec junior. My Dad had 5 brothers. Bill, Tommy, Teddy, Douggie and Alec. The confusion is Bill named his son Alec and also had a brother Alec. Hope that cleared that up! Phew! Also two sisters, Elsie and Rosie who was indeed a dancer who performed in front of Hitler prewar, not completely sure but my cousin Alec (Bill’s son ha ha) thinks it was something Trio, maybe Ascot Trio. Alec is currently going through photo’s to see what he can add. Editor:- Jacquie, sorry to have to tell you that Gloria very sadly passed away in April 2016. Hi everyone, the Regal Club was Bill Nuth, whose son is Alec Nuth my cousin. Alec is just in the process of going through some pictures and I shall be adding more about my family history. I’m really excited about this and looking forward to sharing more history. I lived immediately opposite the Regal Club and remember it well, in particular the dance floor which was very springy. This is what probably disoriented my Dad and affected his ability to walk properly (a lot like dizziness) and therefore what led to Mum and myself having to help him out of the ditch on the opposite side of the road on many occasions! As already mentioned the Nuth family lived in one half of a pair of large semi’s in St Nicholas Lane down the hill from St Nicholas church. In the other semi lived Pat Wall who sadly died at a very young age, don’t remember which school she attended, but wonder if anyone remembers her ? I remember the club well as this was a big part of my young life. The photo shows a girl hugging two boys and another girl between them. The boys are twins David and John McNally in the arms of my older step-sister Maureen Starling, this makes me think the girl between must be June Starling, my younger step-sister (not the best shot of her). Yes the club’s beer-stained wooden floors will always be a fond memory, the music, bingo I’m thinking and the great club atmosphere, something a child never forgets along with the taxi ride home, alas always too early but always loved. Don was the driver, a big car with leather hand-stitched seats. Now I’ve recalled this, my mind I know will bring back more happy nights at the Regal. John Bathurst (11/07/2011), quoting from the Laindon and Pitsea Recorder of April 3rd 1936, tells us that the Regal Club was located in the former Laindon Theomonistic Church. This seldom encountered church appears to be heavily involved in a belief of symbols and spiritualism derived principally from the book of Revelation. What an unlikely church to find in an economically challenged rural Essex village. This adds one more to the extraordinary number of churches, missions and chapels to be found in Laindon. From Bebingtons corner to the station alone (a distance of less than a mile) there must have been the better part of a dozen making perhaps the better part of a score in the entire area. What can possibly account for this large number of churches? I have no comparative statistics but it seems far greater than other Essex villages. One wonders if some rite of desacralization needed to take place before the church could become a drinking spot! What happened to the Theomonistic flock? Where did they go? I also was taken to the Regal by my parents (which was anything but regal) to play on the grass hill opposite which at the time was open grassland up to St Nicholas Church. My principal memory is the bog at the rear of the Regal which was the most evil smelling I have ever encountered. Gloria (Sewell), unless there was an Alec Nuth Snr and a Jnr. I don’t think Alec opened a bar in Spain as until recently he was a member of Orsett Colf Club. David, as my parents also used the club and were friendly with Alec can you tell me if he opened a bar in Spain?? Hi David, love the photo I believe my younger sister and I are on the photo. Our dad over the 40’s and 50’s played darts for the Regal Club and The Crown. 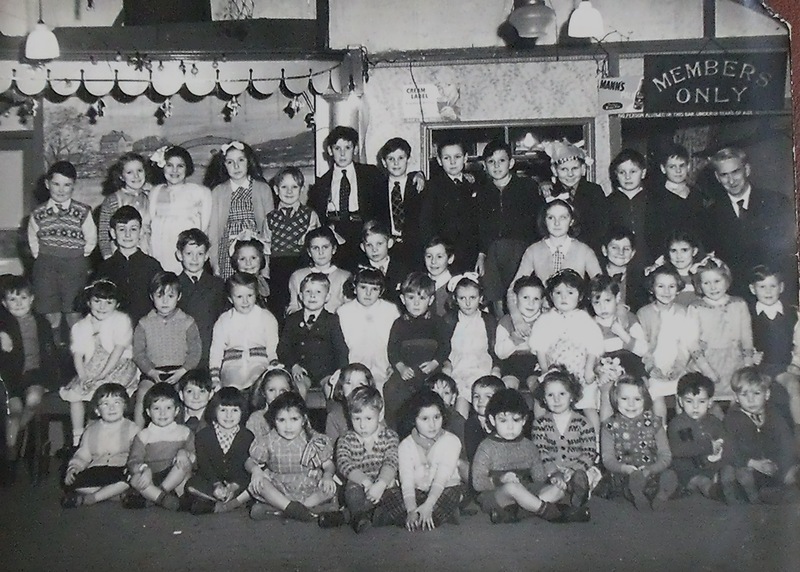 I believe the girl seated on floor 4th from left to right, and I think I am in front of the boy at the right hand side who is standing next to a man. My dad was known as a very good dart player and won many medals, over the years. I’m afraid we were allowed to play with them consequently I now only have four in my possession, one being a Regal medal for 1948/49, they are silver and a good quality, shame we lost all the others. My dad used to be a member of the Regal Club. He would occasionally take my mum and I with him. It was run by Bill Nuth, Alec being his son. They lived at the bottom of Chuch Hill. My dad, George Atkins, worked for Bills brother Pat Nuth. Since I submitted this photo I have spoken to my older brother Donald, who was born in 1938, he confirms a little more information about the Regal which I omitted until I was sure of the facts. Our grandparents Ernest and Maggie Pickering ran the bar there for many years before their deaths. Donald tells me that he spent a lot of time there when he was young, and sometimes was put in the cellar when German planes were going across to London, it was considered safer there for him?? As he got a bit older he often helped out doing odd jobs, collecting glasses, wiping tables etc. Ernest died in 1947, six months before I was born. Maggie carried on with the bar with help from a Mr Nuth, I believe it could have been an Alec Nuth? Maggie died in 1952. I have a vague recollection of her being looked after by my mother for her final months at our home in Noak Hill Road. Ernest and Maggie had lived in a house at the top of Church Hill near St Nicholas and they are both buried at St Nicholas.